The ancient Silk Road was not one, but a series of trade routes, whose nexus was the desert oasis of Kashgar, in Xin Jiang, northwest China. A marketplace, rest stop and meeting place, Kashgar was an important gateway into China, through which passed the trade goods and rich cultural influences of India, Persia, Central Asia, and the Mediterranean. 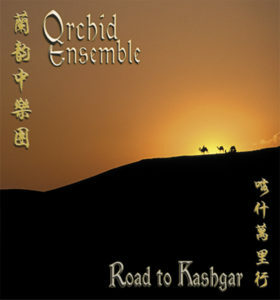 The Silk Road, as an ancient symbol of cultural exchange, has inspired Orchid Ensemble to explore the wealth of these traditional musics, and to create this collection of traditional works and new compositions expressing the rhythms, modes and character of these exotic lands. The Winged Horses of Heaven– Moshe Denburg, 2001 In 138 BC, the emperor Wudi of the Han Dynasty sent his general Zhang Qian to contact a western tribe to solicit help to fight invaders from the north. After 13 years of arduous journeys, adventures and misadventures, Zhang Qian returned with news of a stronger and faster breed of horse to help in the wars. Thought to be of celestial origin, these now extinct horses were the compelling motivation behind the opening of a permanent route to the west of China and beyond. This work was commissioned by the Orchid Ensemble through the Commissioning of Canadian Compositions program of the Canada Council for the Arts. The Taklimakan is a vast desert in northwestern China that had to be skirted in order for caravans to travel between Kashgar in the west and Chang’an, the ancient capital of China, in the east. This infamous desert, which in Turk means “go in and you will not come out”, has been feared and cursed by travelers for more than 2,000 years. The work is meant to be a landscape in sound, moving through several stages and moods: at first quiet and foreboding as the looming desert, and gradual and plodding as a Caravan would surely be. After experiencing the turbulence of a sandstorm, all falls silent and distant again, erasing our footprints, leaving only our thoughts to attempt an impress upon eternity. This work was commissioned by the Orchid Ensemble through the Commissioning of Canadian Compositions program of the Canada Council for the Arts. The first in a series of works of musical pictures of the Silk Road, this piece is meant to depict one of the many possible cultural configurations that one may have met within or near Kashgar. As the rhythmic scheme of 7/8 is reminiscent of the music of Persia or India, this particular caravan is likely approaching Kashgar from the West. This work was commissioned by the Orchid Ensemble through the Commissioning of Canadian Compositions program of the Canada Council for the Arts. Based on the folk melodies from Shandong province in northeastern China, this piece is one of the first contemporary compositions for solo zheng. The piece reflects the simple yet energetic lives of the farmers of the region, accentuated in this arrangement with added percussion. Buddhism was introduced to China from India as early as the 1st century BC and became established throughout China in the 4th century AD. Buddhist music in China was initially derived from Chinese folk melodies and developed into its own specific genre. The influences of these folk melodies can still be heard in this work. There are two widely accepted interpretations for this piece: one refers to three treasures of Buddhism – the Buddha, Buddhist teaching, and High Monks; while the other refers to the three most representative Gods honoured in Buddhism. In the 10th Century, a number of Persian Jews traveled through the Silk Road to settle in Kaifeng, central China. The community they founded still survives today observing Jewish holidays and customs. This arrangement of an Ashkenazi sacred song is a contemporary tribute to the fusing of these cultures. This autobiographical piece was written by Lady Cai of the late Han Dynasty (206 BC-220 AD). Lady Cai was captured by the Huns in northwest China and forced to marry the Hun king. After 12 years of marriage and bearing two children to the king, the Han negotiated for her release. Although overjoyed with the news that she could finally go home, she was also deeply troubled with the knowledge that she would have to leave her children behind. Orchid’s arrangement of this Bengali folk song is a blend of Indian and Persian elements within a contemporary framework, and embodies the cultural blend symbolized by the Silk Road. Iranian singer Amir Haghighi’s voice adds the magical touch to this piece.